FontFolder provides an easy, efficient way to manage Adobe Type 1 fonts (also known as ATM fonts) and TrueType fonts in OS/2. 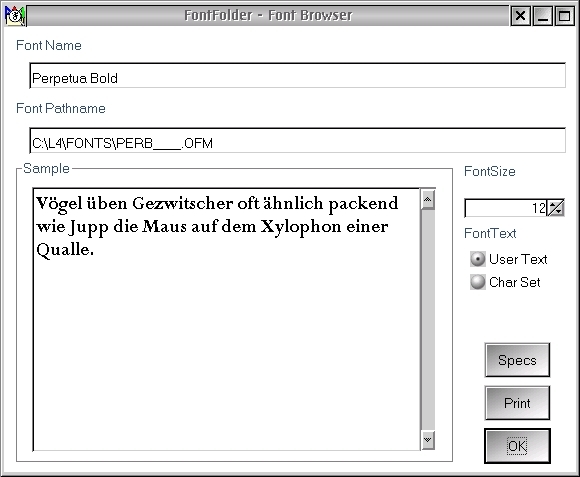 Once a font is registered with a FontFolder Library, the font can be loaded and unloaded in OS/2 from the FontFolder main window with simple point and click operations. With FontFolder you only need to keep loaded those fonts that you are currently using. This saves time and resources since OS/2 only needs to load a small number of fonts on bootup and keep a small number of fonts in memory at any one time. Applications that load all the installed fonts when starting will also start faster, and you will have fewer fonts to scroll through when making font selections. FontFolder now supports TrueType fonts when used with Warp 4. You can use TrueType fonts in FontFolder in the same way you have been using Type 1 fonts, and you can freely mix and match Type 1 and TrueType fonts in Libraries and FontPacks. In general, you should see no difference in using TrueType fonts or Type 1 fonts. The only exception is when registering fonts with a Library. The Register Fonts Dialog has a new set of radio buttons that require you to select the type of font you want to register. You can only register one type of font per registration pass, but you are free to register both TrueType and Type 1 fonts with a library by doing them on separate registration passes. You will be able to distinguish between your Type 1 and TrueType fonts in FontFolder's lists by icons that appear in front of each font name, for Type 1 fonts and for TrueType fonts. FontFolder users who are still using Warp 3 should be able to upgrade to FontFolder 3.0 for the other features, but they will not be able to include TrueType fonts in FontFolder since this depends on the TrueType support built into Warp 4. FontFolder is now drag and drop enabled for almost all operations that you would expect to be able to do via drag and drop (and perhaps a few you wouldn't expect). -Installing Fonts from a Library - Mark the fonts in the Library and then drag and drop them on the Installed Fonts list. -Installing a FontPack - Mark the FontPack to be installed and then drag and drop it on the Installed Fonts list. -Uninstalling Fonts - Mark the fonts in the Installed Fonts list to be uninstalled and then drag and drop them on the FontFolder Shredder icon in the lower right corner of the FontFolder window. -Uninstalling a FontPack - Mark the FontPack in the Installed Fonts list to be uninstalled and then drag and drop it on the FontFolder Shredder icon in the lower right corner of the FontFolder window. -Adding Fonts to a FontPack - Open the FontPack for editing. 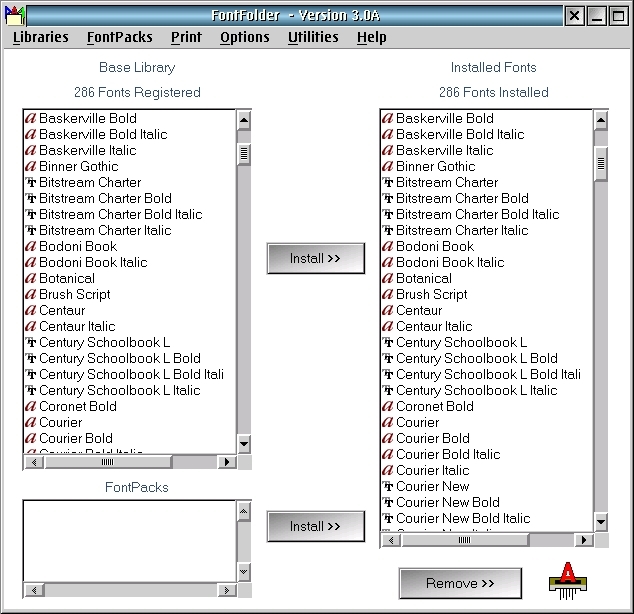 Mark the fonts in the Library and then drag and drop them on the FontPack Fonts list. -Removing Fonts from a FontPack - Open the FontPack for editing. Mark the fonts to be removed and then drag and drop them on the FontFolder Shredder icon in the lower right corner of the FontFolder window. -Deleting a FontPack - Mark the FontPack in the FontPacks list to be deleted and then drag and drop it on the FontFolder Shredder icon in the lower right corner of the FontFolder window. -Drag and Drop any Font File on a Library to register the font - Drag and drop any font file (PFB, AFM or OFM for Type 1, TTF for TrueType) from any OS/2 folder on the Library list and the font will be registered with that library. -Drag and Drop any Font File on the Installed Fonts list to install the font - Drag and drop any font file from any OS/2 folder on the Installed Fonts list and the font will be installed in OS/2. You will be offered the option to also register the font with the current library. -Drag and Drop any Font File on the Browser window to view the font - while the Browser window is open, drag and drop any font file on the Browser window and the Browser will display the font. The font does not need to be registered with a library. A new addition to the Browser is the ability to open a Font Specifications Window that displays technical details about whatever font is being displayed in the browser. This window can be left open while browsing so you can monitor this technical information as you browse through your fonts. Double-click on the link above for the details.